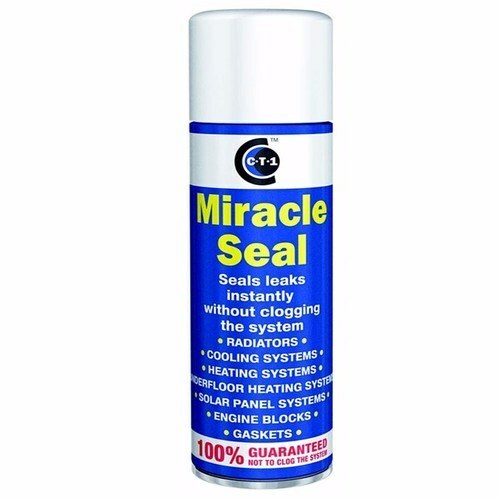 From C-Tec comes the Miracle Seal formula designed and guaranteed to stop and prevent minor leaks, and temporarily repair high pressure leaks without clogging water based cooling systems or mechanisms. Formulated with lubrication and anti-corrosion additives to prevent clogging and further spreading of cracks and leaks, the C-Tec Miracle Seal comes in a non-pressurized container sufficient for up to 25 litres of coolant and is applicable for a wide variety of tasks, from temporarily sealing leaks in high pressure pipes, to fixing hairline cracks in motor blocks and water coils, or even fixing a central heating leak. Developed to make fast emergency repairs to leaking radiators and cooling systems. Compatible with all types of water-based coolants. Seals small leaks and haircracks in head packings, motor blocks and water coils. Non Compressed Canister 250ml, sufficient for 25 litres of coolant. 250ML of Miracle seal will treat 25 litres of Coolant. NOTE: Due to restrictions of the postage of aerosols C-Tec Miracle Seal will be sent via an applicable postage method/courier. You may also be interested in CT-1 Multi-Purpose Ahesive Sealant from C-Tec. Do you think 1-2 bottles of this would seal a water drip in a tank with about 300 gal of water.